Running a successful small business is hard. But these eight kid entrepreneurs are showing that it's just child's play. 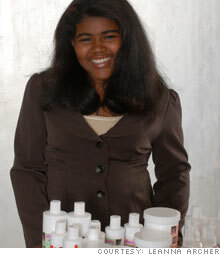 Leanna Archer decided she wanted to become a hair care mogul at the ripe old age of 11. Archer's company, Leanna's Inc., makes eight organic, hair products, which include hair dressings, hair butters and shampoos. Her secret formulas have been passed down through her family for generations and are free of sodium lauryl sulfate and parabens, chemicals which are considered health risks. `'Our products contains no oil filters, no synthetic ingredients, no chemically-engineered ingredients,'' she said. Last year, the company had revenues of more than $100,000. The Long Island entrepreneur expects that number to increase to more than $300,000 by year-end. She is in the process of building an army of sales representatives across the United States.